This is a brand new offering from Kaapstad Safari Tours and Trails for those who want to see the beauty of South Africa, but don’t ride a motorcycle. Arrive at Johannesburg International Airport where you will be collected by air-conditioned transport and transferred to your nearby hotel. Here you can relax for the rest of the day or take advantage of one of the many excursions that are operated by the hotel. You will be met for dinner at one of the local restaurants by your Guide and the programme for the next five days will be discussed. Prepare for some awesome sights ahead. An early start will ensure that leave the bustle of Johannesburg behind and get out on the open road. Your guide will drive you across Mpumalanga Province, passing through small towns rich in history connected with the Anglo-Boer War. You will see a stark change in the surroundings as you leave behind the industrious side of Gauteng Province and pass through small local towns such as Belfast and Dulstroom. Eventually arriving at your overnight stop, you will be amazed at the standard of the accommodation. You will enjoy a fantastic dining experience on the viewing deck and then weather-permitting be treated to a 4×4 night drive where you may well see numerous nocturnal animals. If you are really lucky then you may see the resident territory Leopard. After your first night in the Bush in one of the camp’s beautiful cottages in the middle of the forest, you can take advantage of an early morning bush walk lead by one of the camp’s experienced Bush Guides. After breakfast your Kaapstad guide will take you back on the road into the Kruger National Park. Here you will spend the day driving some of the many roads and trails which your guide is highly familiar with. Lunch will be at one of the Park’s camps and during the afternoon you will make your way to your overnight camp. Don’t let the word camp throw you…. your accommodation will always be of a good standard. Dinner at the camp this night. 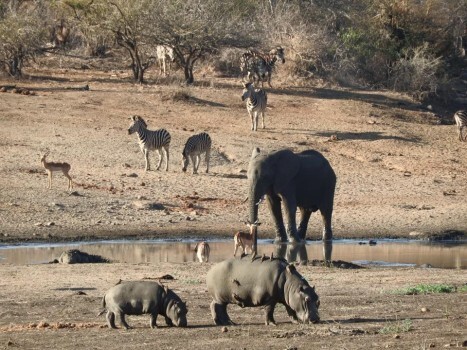 Breakfast at leisure in the camp then let your guide treat you to more fantastic game-viewing within Kruger Park. Don’t forget your guide is a highly qualified Bush and Trails expert at the top of their game, so ask questions and learn about the animals and birds you are certain to see. Dinner and overnight at the camp again tonight. Breakfast and more time in the Kruger National Park, or let you guide take you out of the Park and to some of the main sightseeing attractions that lay just outside. Harrys’ Pancakes is always a winner! You will be heading towards one of the premier private reserves in the area for your stay tonight. This is a Big Five reserve where the staff guides will take you out for a 4×4 sundowner drive before you return to the bona for an amazing evening meal. Sit and sip GnT as you listen to the sounds of the wild and bush stories around the camp fire. Enjoy a early morning bush walk or drive, depending on numbers, then a hearty breakfast. On leaving the reserve there may be time to call in to the local town of Hoedspruit, but this does depend on your flight time from Johannesburg Airport. The journey back will be relaxed and finally you will say your goodbyes to your guide before either heading back home or extending your South African adventure with a few days in Cape Town. What ever you do, we know you are going to take home with you some amazing memories and hopefully some brilliant photos! If you are reading this review, you are no doubt in the same situation that I found myself in when trying to choose a company for a South African Safari….. In short, too many choices, not knowing who to trust, and on top of that working your way through the minefield of what to pay! Well look no further… Kaapstad Tours run by Alex J. Jackson is absolutely first class. My family were given a very bespoke service, we stayed in excellent accommodation and were given a personal guide and tracker. 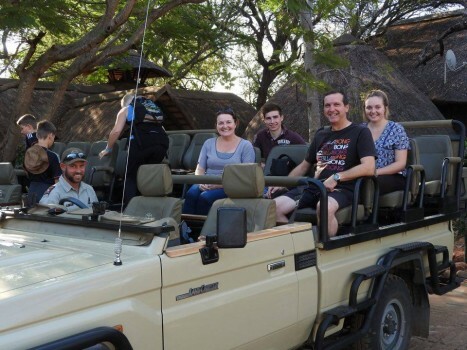 The safari experience was the best holiday I have ever been on (my wife and I are experienced travellers and have previously completed a round the World trip and have also previously been to Africa). We saw “The Big 5” very soon after going into the Kruger National Park and the obvious abundance of wildlife/, flora and fauna. I enjoyed tracking the animals as much as seeing them. I thought my teenage son and daughter would be bored at times, but I couldn’t have been more wrong – they absolutely loved it. I think I have said enough, rest assured that if you contact Alex, all of the stress of booking such a major holiday will dwindle away due to his professionalism.